Legal news for Vermont workplace accident attorneys – Two men were injured when the helicopter they were employing to string power lines crashed. Two workers sustained injuries after chopper fell 60 feet. Brattleboro, VT (www.NewYorkInjuryNews.com) – Aviation investigators are working through details of a helicopter crash in Vermont on the morning of Wednesday, April 21, 2010, as reported by the Reformer. The MD-500 helicopter was being used to hang utility lines in Brookline, Vermont, when the chopper suddenly dropped 60 feet to the ground, into a hilly area near a series of utility poles. The men were working on Vermont Electric Power Co. (VELCO) property near Grassy Brook Road. Using choppers to string power lines is approved by the Federal Aviation Administration (FAA). 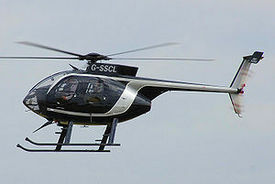 The helicopter’s pilot, Robert Clymer, and his passenger, Michael Gailotti, suffered minor injuries and were taken to Dartmouth Hitchcock Medical Center in Lebanon, NH. According to reports, 56-year-old Clymer was conscious and walking after the crash. Gailotti sustained slightly more serious injuries, as he was working outside the aircraft on the landing skids at the time of the crash. As of Thursday, April 22, there was no additional information on the men’s conditions. On Wednesday, the Vermont Agency of Transportation and the FAA began their investigations into the crash. Because there were no fatalities in the crash, state police stepped out of the investigation. They were initially involved to protect the scene and begin investigations. Authorities have not yet determined the cause of the crash. Legal News Reporter: Tara Monks – Legal news for Vermont workplace accident lawyers.